Resurrection Meal – Sunday April 10, 10:30 a.m. The resurrection of Jesus from the dead – awesome! The appearance of the risen Lord to his friends in the garden outside the empty tomb, and in that room of Jerusalem – amazing! But with the return thereafter to daily lives in the realm of the ordinary, what difference would all this make? This is the question we explore as we are told how several of the first disciples had returned to their fishing (John 21:1-14) . The scene opens as they find themselves doing more of the same with less and less satisfaction, fishing all night without a single catch. It is exactly as many would presume, that the resurrection of Jesus changes little for us, here and now. 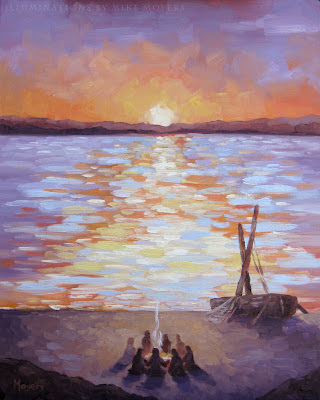 The scene concludes, however, with the disciples sitting on the shore with their Risen Lord, joyfully sharing breakfast ‘with their faces to the rising sun’. The gospel is not only that Jesus was raised, but that he is risen … that the Risen Lord is with us … and that by his presence, this ordinary places and days of ours are filled with both assurance and possibility. Join us in worship this Sunday, including Holy Communion with the Risen Lord!